No expense was spared to make this the best Bluetooth keyboard possible. That includes putting a much bigger battery in it than we had to - 1,600 mAh. That's big enough to last 6 months to a year, on a single charge (under normal use). Mechanical keyboards offer the best performance, but they're noisy - too noisy to use in most offices, or around other people. This is the first one that's quiet. 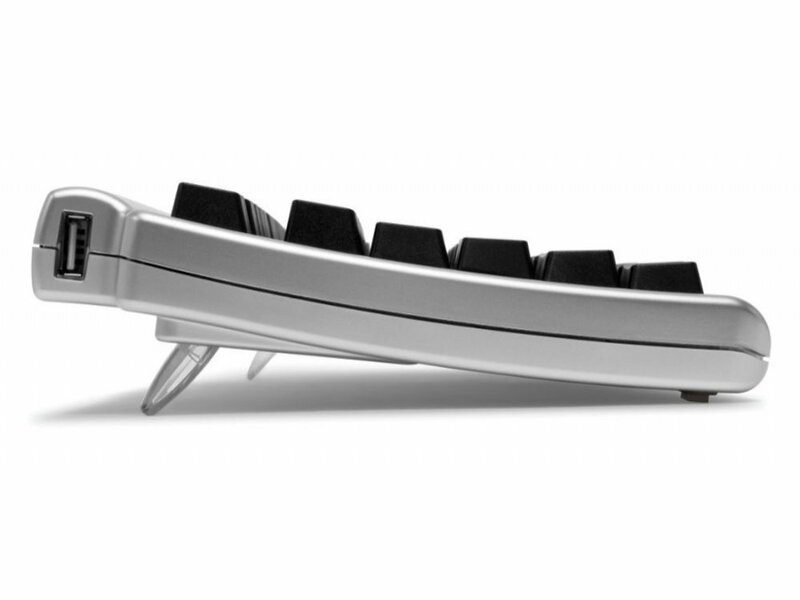 Over two years in the making, it�s the only mechanical keyboard that keeps both your fingers and your co-workers happy. If you're a fan of the legendary Apple Extended Keyboard II, the Laptop Pro is for you. 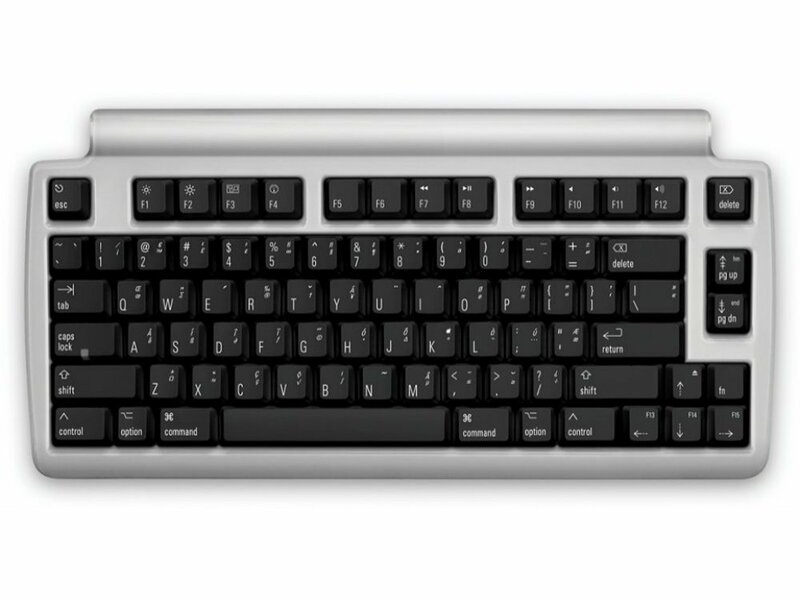 It was the inspiration for our design, and you can feel that heritage in every keystroke. Just like an Apple keyboard, the Laptop Pro�s function keys let you control screen brightness, volume, iTunes, and more. Also connects to iPad & Android tablets, PCs, and other Bluetooth devices. We designed the keyboard to connect wirelessly to your Mac, but it's actually a standard Bluetooth connection, so it'll work with any device that supports Bluetooth keyboards. That includes... Macs, PCs, the iPad, iPhone, and iPod touch, Apple TV, Android 3.0+ smartphones and tablets, Samsung Galaxy Tab, BlackBerry PlayBook, and many more. The Laptop Pro has special Anti-Ghosting Circuitry (also called n-key rollover) to eliminate these problems. You can type as fast as you're able; the Laptop Pro will keep up. Well built keyboard with good key stability. Bluetooth connected immediately to my Mac. Keys are really quiet as specified and have very nice feel to it. I enjoy typing on the keyboard. Great keyboard. Only the right Cmd key doesn't work for some reason, but I guess it will require some extra config? Been using the keyboard for about a month now and I feel confident to write a fair review. I waited quite long to get the keyboard as it was sold out for months but I was patient, as there are no alternatives on the market for a small sized, mac layout, bluetooth, mechanical keyboard. First of all I must say that I am completely satisfied with the ordering and shipping with keyboardco.com. Let's talk about the good things. The keyboard itself works perfectly fine, I have no connection issues and all keys function properly. There are also no coloring problems or anything else that could lead back to bad quality assurance. I really like the layout and the extra symbols on the keys. The keyboard is not super quiet but more though than standard mechanical boards. What I don't like. The most important thing why people still prefer mechanical keyboards is the feeling. And I must say that this is the main issue I have with this keyboard. The keys don't feel that nice to write on. I often find myself wondering if I have actually pressed the key or not. It feels a bit wobbly. I am also not a big fan of the shiny silver styling which makes it look a bit cheap compared to a mat black look for example. Anyways the main issue is the keys, compared to my previous board, the steelseries g6v2, the keys feel much worse. The keys are more quiet but make sure you really need that, because if not, then there are better boards out there imo. I took delivery of the Matias Quiet Laptop Pro a few weeks back. The first one delivered was faulty, something wrong with the backspace and the left CMD key. I contacted KeyboardCo and after some initial troubleshooting we agreed to exchange the keyboard for another one. I received the second one without any trouble and I absolutely love my new keyboard. It's one surpassed by my Matias Tactile Pro (3), but that's just too loud in an office environment. Too bad the initial delivery was a faulty one, but the way the team at KeyboardCo helped me along by providing helpful suggestions and exchanging the item... KeyboardCo is my absolute number one stop whenever I need to buy another keyboard. Excellent customer service. I have been user of Matias keyboards for the last errr ... 15 years... This one did not disappoint either... Soft and quiet, brilliant for long coding and typing sessions and I do not mind keeping 2 additional pounds it in my rucksack. One thing to keep in mind though - its a bluetooth only keyboard (which is fine most of the time, considering lack of usb type-A ports in modern Macbooks), but if you are like me who needs occasionally to plug your keyboard into servers and workstations, you will need to keep your old USB keyboard around. Excellent service and prompt delivery from Keyboard company. Keyboard is great, nice feel, nice layout. Exactly what I wanted. However I am disappointed by the keycaps, my CMD key has some extra plastic on it and my PG_END key has some kind of light white stain on it. Reading other comments, I feel like Matias QA on their keyboards need some improvement. It seems well built, and feels good to type on. However, I've returned it after less than an hour of use. It arrived with a fault (the 'p' key often produced two 'p's), but I'm sure that a replacement (or two) would have fixed that. Worse was the bluetooth interference with my Apple Magic Trackpad - roughly every 10s the trackpad would stop responding for 1s. I tried the suggestions offered by KeyboardCo, but nothing helped. I'm not convinced that this was a problem with the item, so KeyboardCo agreed to a refund without question. Though I'm disappointed the keyboard doesn't work in my environment, I'm very happy with KeyboardCo. My Matias Laptop Pro arrived today. Paired it with my Mac without a hitch -- best keyboard I've ever used, and I've used a few. Thanks for the speedy shipment.